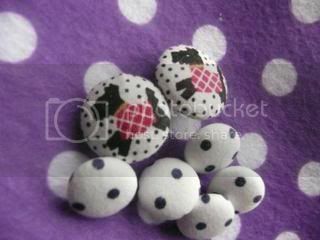 These are the lovely goodies that arrived from Joanne, my partner in the Polka Dot Swap. 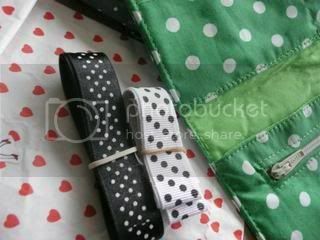 Dotty fabric, dotty grosgrain ribbon,cutest dotty Scotty dog buttons and a fabulous wallet with lots of room for cards! And what did I send her ? well..this silly billy wrapped her parcel late at night and forgot to take photos.Duh ! Joanne has received her package and will be posting pics soon. 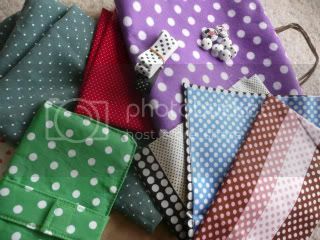 I sent some fabric, buttons , cappucino set with spotty giraffes and a little quilt with cat applique for her cat's basket.